Save $89 over individual component pricing by purchasing a level 3 kit. The kit mounts to the unibody of your B-Body Mopar and adds strength and stiffening to the entire unibody structure. This the most complete kit and adds the most strength available, short of adding a full roll cage to your car. The factory engineers added stiffening to some ares of the B-Bodies, so they recognized the benefits of the bracing 40+ years ago. We've just got the benefit of seeing how these react to the added chassis stiffening. 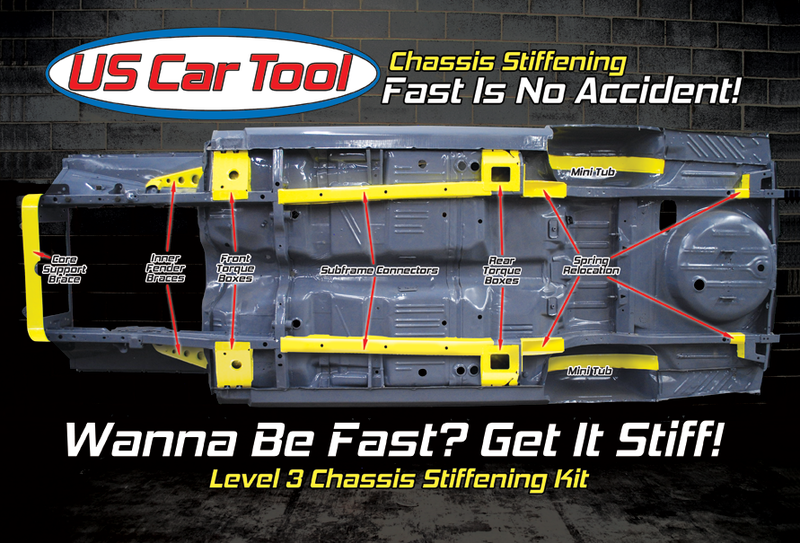 Any car will benefit from the additional chassis (unibody) stiffening, especially if you are increasing the horsepower or just want you car to feel more "solid" going down the road. The Level 3 kits goes further by moving your leaf springs inboard 3" per side and adding 4" of wheelhouse tire area for Maximum Tire size and width.